We just spent the last week since our launch sending out orders, taking in all your feedback and also recovering from our launch party and 3 day pop-up shop that happened over the weekend. It was such a great time being able to meet everyone who came down and talk about some of our products. To those who got themselves a piece of some of our Moroccan Safi ceramics we hand carried back from Marrakech, good on you! Hope you're enjoying them so far. Unfortunately, for those who have asked, we are unable to launch the ceramics online due to the nature of the products. These ceramics are extremely fragile and we do not want to risk leaving them with a courier or send them thousands of miles only for you to receive broken pieces. You can get yourself a piece of what's left at our next pop-up shop in Singapore happening on December 2nd. More details to come! 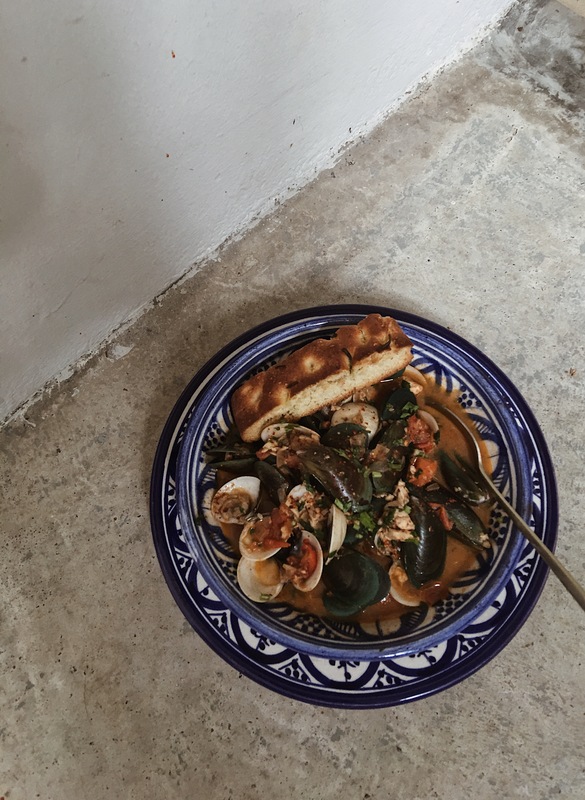 I thought I'd share today one of my favourite recipes with everyone- a classic Italian fish soup with Mediterranean flavours. It cooks fast, preparation is easy and can be done ahead of time. I love having this with some crispy bread for dinner. It is one of the most luxurious ways to treat yourself if you're cooking for one in my opinion. But also just as great shared in a party as a starter. The measurements in this recipe serves 4 as a starter or 2 as a main. I make this soup ahead of time by preparing a fish stock by myself. From the shrimp, I remove the shell completely and set it aside in a pot. In the same pot with the shrimp shells and heads, I add in half an onion, some tomatoes, a clove of garlic, a bay leaf, the skin of the white fish and some wine and tomato paste. I put about 3 cups of water into the pot and let it simmer for about 30 minutes. Heat up your fennel seeds before crushing them in a pestle and mortar, the heat really makes the herb more fragrant. When you are ready to make your soup, strain the stock keeping just the liquid and set it aside. In a separately pot, stir fry some garlic in olive oil before adding in the onions and diced tomatoes. Add in a bay leaf and the chopped thyme. Season with salt and pepper and cook until the onions and tomatoes have softened after 5-6 minutes. Add the saffron, red pepper flakes, fennel seed and tomato paste shortly after. Now you can add your fish and shrimps. Pour over the white wine and let it simmer for 1 minute before adding in the clams and mussels. Your soup should be ready in the next 5 minutes, season it to taste and serve it with toasted crisp bread and a squeeze of lemon together with the chopped parsley.